Tele-Macro Focal Length: The convenient 100mm focal length of the Canon EF 100mm f/2.8L Macro IS USM Lens allows for a comfortable shooting distance between the camera and subject, and less chance of shadow interference when shooting at closer focusing ranges. Life-Size Image Reproduction: The lens allows for continuous focusing down to 1:1 life-size magnification. Optional extension tubes can increase this ratio for even greater magnification. 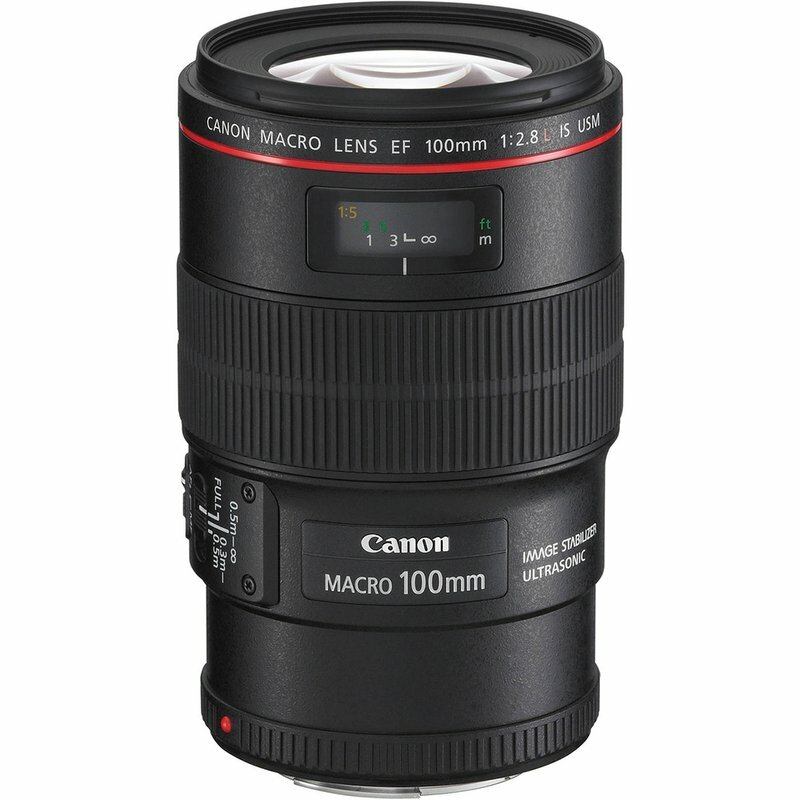 L-Series Optical Quality: As a Canon L-series optic, the Canon EF 100mm f/2.8L Macro IS USM Lens can be counted among the sharpest, best-built, weatherproof optics available for Canon EOS SLR cameras. Hybrid Optical Image Stabilization: With the vibration gyro and acceleration sensor, the hybrid image stabilization system is effective for close-up shots. With a 4-stop compensation the IS enables blur-free images when shooting telephoto in low light and when working close-up in macro mode. Quick and Quiet Focusing: By incorporating an ultrasonic focus motor, Canon has improved the speed and reduced the noise levels of the lens's autofocus system, while still allowing for full-time manual override. Focus Range Limiter: Focusing distance range can be selected with a switch on the lens barrel. By setting a suitable focusing distance range, actual autofocus time can be shortened. The three focusing ranges are 1-1.6', 1.6'-infinity and the full range of 1' to infinity.